Smitaji is highly regarded in the Financial sector with an experience of more than 10 years. She is a Certified Financial Planner (CFP) which is the most prestigious and internationally accepted Financial Planning qualification recognised and respected by the Global Financial company in 26 different countries. She has been recognized and awarded by Sundaram Mutual Fund and Reliance Mutual Fund for her dedicated services. She is currently managing portfolios of 500 clients including Individual, Corporate and NRI client with a total asset of more than Rs. 50 crores. 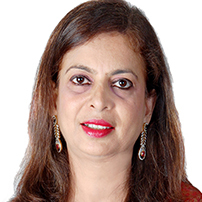 She is currently representing ALL (All Ladies League), a global organization for women empowerment, as the Country Committee Chairperson, India for Financial Freedom. You’ll be amazed to know that she started her career at the age of 45 years despite being married in a conservative Gujarati family and having two kids. This did not stop her from dreaming big and achieving her goals. At the age of 50, she studied for a year and gave numerous exams and came out as a successful Certified Financial Planner (CFP). Not only in the Financial sector but she is also deeply involved in working diligently towards the betterment of society through her social service. She is a member of Jain Sakhi Manch and Kasturi Foundation, an NGO serving Cancer patients. She also actively helps various orphanages and is involved with the Raj Roti Bank that provides food to the needy. During her college days, she has closely worked with Mr. Vijay Merchant (a well-known cricketer and industrialist who worked towards supporting the handicapped and blind) in the field of social services to organize medical as well as counselling camps. She was recently offered to stand for the elections by Mr. Mangal Prabhat Lodha, BJP MLA. . She is currently the President of JIWO (Jain International Women Organization), Central Chapter, Mumbai. Smita ji has also conducted various awareness sessions for empowering women to understand the importance of financial security in life, which is the key to their success. She is also an active IMC (Indian Merchant Chambers) member. Despite her accomplishments, Smitaji does everything with utmost humility. She brings out the best in everyone she works with and her example of selfless dedication is an inspiration to every woman. She is truly a woman of substance.